The research project ‘EcoViz’ makes a contribution to conception, design and market implementation of so-called ‘transformational products’. The main idea of these products is self-realization, which means the ability of humans to recognize their potential and exploit it. EcoViz developed and evaluated basic concepts of transformational products in the field of sustainability. Developed by the Company ‘raureif’ the ‘EcoChallenge’ is one exemplary product, which has already been brought to market since EcoViz has started. 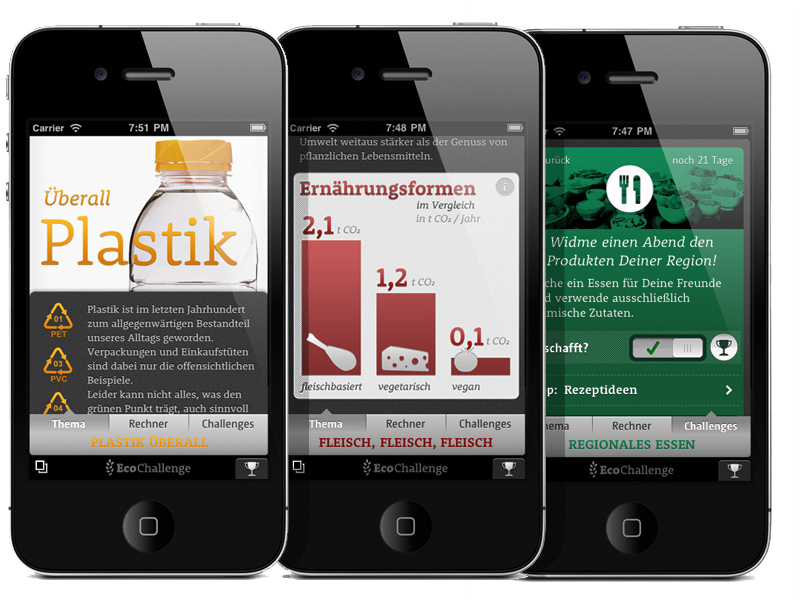 ‘EcoChallenge’ is an app for the iPhone and it has the goal of long-term attitudinal and behavioral changes in the everyday consumers life, regarding their sustainability performance. ‘EcoViz’ is a research project of the design department of the University of Applied Sciences in Potsdam and is funded by the Ministry of Science, Research and Culture of Brandenburg. For more information on the project ‘EcoViz’ and related projects, see www.consuming-energy.org. The official website of ‘EcoChallenge’ with more information on this project example is www.eco-challenge.eu.